I don't usually like doing two outfit posts in a row but I have so many outfits to show you lately that I thought I better! Plus, the weather has been gorgeous today and I think this outfit is definitely fitting for it. I was sent this playsuit a while ago and have loved it ever since. Whilst I'm not usually that big on neons (you all know I'm a pastel girl at heart) I can't help but love them when summer comes around, especially considering how well they show off a tan. 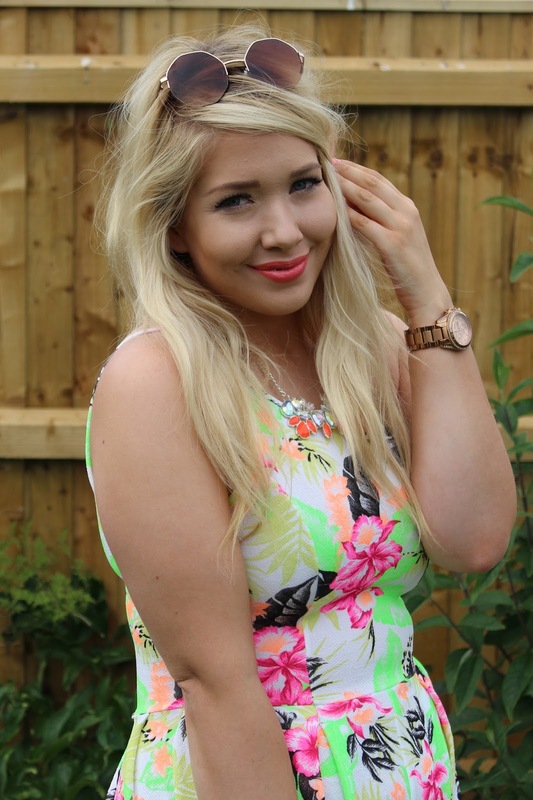 I'm loving neon florals at the minute and this playsuit is a perfect example of why. I thought I'd pair it with my cute embellished sandals from River Island a few years ago, my neon orange statement necklace from H&M and my uh-mazing new sunglasses from Claire's Accessories. I wasn't keen on them at first but I'm totally in love with them now! I hope everyone has been enjoying the sunshine today - are you loving neons in this weather?